Contingent on approval from the Higher Learning Commission (HLC), the University of Tetovo(UT) anticipates welcoming NIU Business faculty in spring 2019 when they travel to the Balkan Peninsula to provide MBA instruction to students from Macedonia. This academic proposal – created through a strong partnership that the NIU College of Business established with UT, and with the help of the U.S. Embassy in Macedonia — represents a significant first. Upon approval from the HLC, the NIU MBA degree will be the first U.S. graduate level degree of any discipline from any U.S. university to be offered in the country of Macedonia. “The University of Tetovo has been a strategic partner with NIU since 2014. This next step in our ongoing relationship with such an outstanding university builds on our earlier collaborations together. We continue to advance our shared efforts to promote peace and prosperity through education, dialogue, diversity and an enlarged worldview,” says NIU President Dr. Lisa C. Freeman. NIU and UT began their work together with faculty exchanges. Within one year their efforts culminated in the 2015 creation of a shared Center for Peace and Transcultural Communication. The center, located in Tetovo, Macedonia, is administered jointly by faculty from the NIU College of Education and faculty at UT. Recently, the head of each institution — NIU President Dr. Freeman and UT Rector Vullnet Ameti — received an honorary degree from their partnering university to reflect the significance of the NIU-UT academic relationship. The next phase in the NIU-UT academic alliance is anticipated to occur in January 2019 with plans for the NIU MBA program to offer three cohorts of the year-long program in the Balkans, once approved by the HLC. “This partnership between NIU and UT brings to life our vision for collaboration to deliver academic programs that impact the lives of students from across the world. 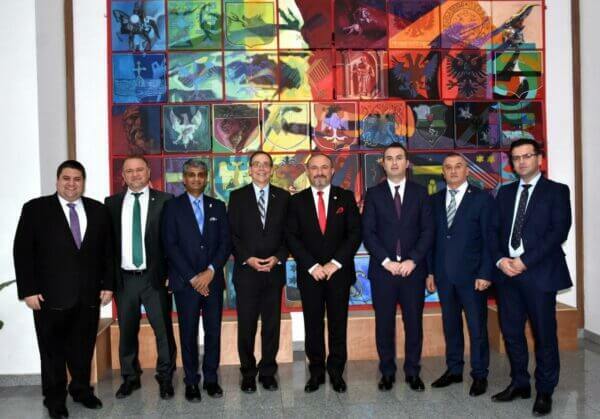 I am excited about the possibility of launching the MBA program in the Balkans, and look forward to seeing many more such initiatives in the future,” says NIU Provost Chris McCord. 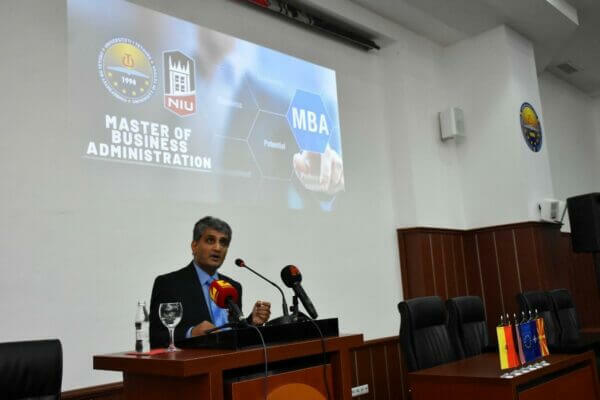 “Our partnership with UT is a perfect match,” says NIU College of Business Dean Balaji Rajagopalan, who gave a formal presentation about the proposal during a November 29 meeting in Macedonia. Ceremony attendees included UT leadership and faculty, the U.S. Ambassador to Macedonia, two Ministers of the Macedonian government, business leaders and students. NIU Business Dean Balaji Rajagopalan addresses UT faculty, the U.S. Ambassador to Macedonia, two Ministers of the Macedonian government, business leaders, guests, and students during the November 29, 2018 ceremony in Macedonia. Plans for MBA program content continue to emphasize cutting edge material consistent with the high-quality that the market expects from NIU programs. Content delivery, however, will be modified to include face-to-face and distributed learning. Pictured from left to right: Anthony Preston (NIU Business Global Programs Executive Director), Arber Celiku (Vice Rector, University of Tetovo), Balaji Rajagopalan (NIU Business Dean), Ambassador Jess Baily (U.S. Ambassador to Macedonia), Vullnet Ameti (Rector, University of Tetovo), Arber Ademi (Minister for Education and Science), Raman Ismaili (Dean, Faculty of Economics), Bardhyl Dauti (Minister for Foreign Investments). NIU as a whole has increased its focus on global citizenry and continues to build upon its international partnerships, inspired in part by the decades-long excellence of its earlier global academic relationships. The College of Business alone has developed business education relationships with universities in South America, Europe and Asia. To strengthen these efforts, Dean Rajagopalan recently joined the board of directors at WorldChicago, an organization committed to advancing citizen diplomacy. UT enrolls 25,000 students — who share the same talents and energies as NIU students — including a commitment to social impact and social justice, particularly in an increasingly interconnected world. The NIU College of Business first earned AACSB International accreditation — the world’s highest standard of excellence for global business education — in 1969, just eight years after its founding. The college is one of few to enjoy a national ranking for 32 consecutive years based on the annual U.S. News & World Report ranking of best business colleges. More recently, a top 100 undergraduate business programs ranking from Poets & Quants, and a top 100 ranking from U.S. News & World Report of the part-time MBA program puts NIU in an elite category. NIU Business alumni number more than 60,000 — many holding C-suite executive positions in companies of all sizes — located in the Chicago metropolitan area and around the world. Previous Post:Natalie Andzik and Xiaodan Hu were selected to participate in the Principal Investigator (PI) Academy, sponsored by the NIU Division of Research and Innovation Partnerships.